Има такива книги - като любовта. Не ми се говори за тях, защото са твърде изящна и лична работа. "Имате ли шепа син овес? - това ми звучи в главата, както и "много, много някога"... Не приказки, поезия в чиста форма. А, и рисунките на Коваленков са велики, особено Прашинко, когото обичам. So, what I'm actually reading is a Russian translation of a selected collection from 1987. How many of the stories it incorporates, I know not.Most of the tales are explanations about how the natural world works. Most also include anthropomorphic animals, things and concepts. It was a very strange set of tales, certainly like nothing I've read before. 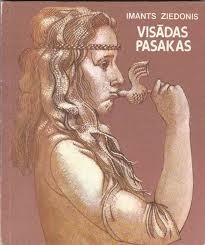 I need to read them again, and also look into Latvian tales more, to see what sort of tradition the author is coming from. Because I feel like I'm missing something here. Like, am I looking at retellings? Am I looking at social commentary? Am I looking at an example of Nonsense literature? Strange, strange reading experience.1. A Blue Tale: The Blue Horse of Hope and Dreams was created as the Eternal Horse. But he must always be alone, because that's how one dreams best. And he must be hidden in mist and shadow and the far away, because that's where people look like when they dream. If he eats mortal food he will become mortal and die. He only occasionally allows poets into his presence.2. An Amber Tale: The author is taken into two Amber factories by a mole. In the first one idiots make things for morons, according to the mole. They don't speak the language of Amber, and just make useless items like soap dishes and handles for fly swatters that no one needs. The second factory employs artists, who speak the language and work with the amber to create living art. The author is allowed to take an amber with him, and he picks Love, which worms his heart and life forever.3. A Running Tale: Many things run because time is lazy and needs to be shown an example, or it will stop. But some things do not run, so there is room for preference, so long as some things run.4. Tale of a Miser: A Miser lives under a fingernail and collects dirt, but the owner of the fingernail cleans it out from time to time. His friend has ten Misers who collect dirt all winter, and in the summer there are ten more, because he doesn't wear shoes.5. A White Tale: The snow turned the world white and no one can find anything. Then the mole catches a white fish and takes out from inside of it a white duck. Inside the duck, as we know, is an egg. Though the story doesn't tell us, we all know that inside the egg is a needle and on the end of that needle is Koshey's death. So let the mole know when the egg arrives.6. A Black Tale: This tale is so dark, you cannot see it, so might as well blindfold yourself and feel around hell, where everything is black. Black devils watching black TVs with black screens and black books with black letters being stolen by black baby-devils. Bad grades being fought over by the baby-devils, while light is banned. When a baby-devil brought a pocket flash light into hell they banished him. Now take your blindfold off and stop feeling up the devils.7. A Yellow Tale: The Author was eaten by the yellow cow who mistook him for yellow flowers after he rolled around in the yellow field under the yellow sun. Bummer.8. A Bear Tale: Momma bear had three babies: Berry bear, Fly bear, and Honey bear. Then she dies, and the forest dwellers try to figure out what to do with the kids. Fly bear is good at catching flies, so he gets a job at a restaurant and becomes a lecturer on fly catching. Honey bear gets adopted by some woman who already has 39 other bears. And Berry bear goes to live with an old woman who sells spices, teas, berries and the like. He likes working for her, and he also likes lifting heavy things, which is how he sees the stone bear statue for the first time. He becomes attached to it (he must be missing his brothers, though that's never mentioned), but is chased out of the park where it stands when he wants to take it home. But then he finds out that there are many bears in the city: teddy bears, wooden bears, stone bears etc. And then he gets to know some of them. And it fills the gaping hole in his heart where his brothers and mother used to be?9. Tale with a Button: Hair-Pin tells Button that being sewn onto something is the worst thing ever, and that Button should avoid Needle and Thread. Button runs home, terrified, but everywhere she looks are things with sharp ends: hedgehogs, forks, buildings with flag poles -- endless horror. Button is so scared that she runs away and falls into the dirt, getting mud into her holes. She is then mistaken for a coin by Zipper, who wants to use Button to buy soda from a vending machine. They argue when Button insists that she is in fact a Button. The argument attracts Needle, who orders Button to come meet Thread. Button is terrified, and soon finds herself sewn onto something, surrounded by other buttons. Everything is buttoned, even the sky (Sun Button for day, Moon Button for night), even the vast universes are all buttoned.10. A Grey Tale: The color Grey is contrast which makes all the other colors stand out and be beautiful.11. A Mottled Tale: The Mottle-er lives by the ocean side and runs around making things colorful. Sometimes that's a good thing, and sometimes it's a bad thing, but it sure keeps life varied.12. The Terrible Adventures of the Dust-ling: The Dust-ling was caught up by a rain drop and ended up in the ocean riding a Stick-From-an-Ice-Cream. Him and the stick became friends, and even managed to reach and each an orange peel together. But then they ended up in some place with ice, and both froze. Dust-ling was picked up with the ice and dumped in a basement, where he was imprisoned for several years. Finally his ice bit was picked up and he managed to escape. He felt ostracized and unwanted when the bees rejected him for being dust instead of pollen. Bees are racist. Then he met the author and they became friends. The author concluded that the Dust-lings are good people who have lost their way, and just need to be given a purpose in life. But despite the Dust-ling doing things for the author, the author hasn't bothered to learn their language. Not cool.13. Dog named Foons (it rhymes in Latvian): Haircut gets Foons the dog to chase away Wind, which doesn't care for Haircut's fashion sense. Foons has a beef with Wind, because Wind used to tickle Foons when he was a puppy and tickled out all of his laughter, leaving only anger. So, all day long Foons tried to catch the Wind, but failed. Towards nightfall he met a friend of his, who explained that Wind is inside us, and cannot be gotten rid of. The friend then played a sad melody on his recorder, and Foons lost all his anger, only to have it replaced with melancholy.14. A Tale about a Muzzle and a Thimble: Thimble ran away because it was tired of being a thimble and wanted to be a bell. Muzzle was discarded by a dog who decided he wouldn't bite ever again. So they met and decided to search for a face for Muzzle and a tongue for Thimble. The met a Jam, a Bowl, a Cow (who offered her spare tongue, but it was too big), a Shoe and a Brush, and finally a Bell. The Bell told Thimble to go back to her job. Meanwhile Muzzle disappeared, but we are told he's always watching, so if you have a face -- take care.15. A Brown Tale: The Brownies make the world brown. When something is ready they show up and scream "It's brown! It's brown! It's ready!" The author tries to see them turn things brown, but he fails until one day he randomly sees them on the beech, making his friend all brown. But his friend doesn't believe him.16. Croco and Dile: two friends get Crocodiles who get into shenanigans, so eventually the friends let them go and show them how to get to the Nile. Lots of croco-words. Varbūt nevajag pārlasīt bērnības grāmatas - viss skaistums nokrita, kad pārlasīju. Dažas pasakas ir ļoti saistošas, bet visas rakstītas vienā stilā, nepārsteidz. Ziedonis tikai tā starp citu nomaina pasakām nosaukumus, bet visu raksta kā muļķodamies, īsti ne pie kā nepieķeroties, neko necenšoties iemācīt, un tai pat laikā - mācot tīrīt nagus, nespēlēties ar uguni, mīlēt mežu... bet kaut kā garāmejot.Bērniem patiktu. Man vairs ne ļoti. Klasika, protams. Bet kaut kā bija sagadījies, ka nebiju visas tās lasījusi kā pasaku krājumu. Tagad bērniem priekšā izlasīju. Man patika tās, kur es redzēju ko vairāk nekā tikai valodiskas asprātību spēles: Lāču pasaka, Dzintara pasaka, Zaļā pasaka, Zilā pasaka, Uzpasaka. Nepatika tās, kas uz beigām, jo vairāk šķita kā tāda spēlēšanās ar valodu, vārdu mežģīnes bez īstas jēgas (Cukurpasaka, Ķeburkājis). Bet bērniem tīri labi patika arī tās. Visas foršās pasakas vienuviet, no "Baltās" līdz "Šķībajai". Rotaļīgas un gudras, par svarīgiem sīkumiem (melnumi aiz naga) un nopietnām lietām (skriešanu tādēļ, lai Pulkstenis neapstātos). Varbūt arī idealizētas, jo pirmo reizi lasītas bērnībā, kad par jebko tiek domāts vispārākajā pakāpē. No otras puses, šarms nav zudis arī pēc 30 gadiem, nu jau lasot dēlam. Imants Ziedonis - Dzejnieks un publicists. Dzimis zvejnieka ģimenē 1933. gadā Ragaciemā – nelielā ciemā pie Rīgas jūras līča. Bijis ceļu strādnieks, skolotājs Slokā, bibliotekārs Ķemeru bibliotēkā. Publicējas kopš 1957. gada. Neklātienē beidzis LVU latviešu valodas un literatūras nodaļu (1959) un Augstākos literatūras kursus Maskavā (1964). Kopš 60. gadu vidus nodarbojas galvenokārt ar literatūru. Bijis Latvijas Kultūras fonda dibinātājs un pirmais priekšsēdētājs (1987-1993), Latvijas Republikas Augstākās padomes un Saeimas deputāts un Latvijas Institūta vadītājs (1998-2000). Sarakstījis scenāriju dokumentālajai filmai “Gada reportāža” (kopā ar H. Franku, 1965), mākslas filmām “Pūt, vējiņi!” (kopā ar G. Piesi, 1973), “Puika” (kopā ar Aivaru Freimani, 1977) un Imanta Kalniņa operai “Spēlēju, dancoju” (1976). Daudzi I. Ziedoņa dzejoļi ir komponēti. Atdzejojis A. Bloka, V. Majakovska, A. Puškina un citu autoru dzeju no krievu valodas. Goda nosaukumi un prēmijas: LPSR Valsts prēmija (1967), Nopelniem bagātais kultūras darbinieks (1972), H. K. Andersena prēmija (1976) par sasniegumiem bērnu literatūrā, LPSR Tautas dzejnieks (1977), J. Korčaka zelta medaļu par ābeci “Sākamgrāmata”, Triju Zvaigžņu ordenis (1995).2010. gadā Jaunajā Rīgas teātrī Alvis Hermanis iestudējis izrādi "Ziedonis un Visums" ar Kasparu Znotiņu galvenajā - Imanta Ziedoņa - lomā.